Congratulations to Carol, our final winner of the Math Minute Adopt-a-Microbe T-shirt contest! Enjoy your t-shirt. And a big thanks to all the math geeks who followed along with us during the expedition and learned how much math goes into everyday activities here on the JR. I’d like to give a shout-out to our one eager calculator who submitted answers for all 6 weeks…the grand slam of math! Way to go Paolina! These math questions and answers will be available here on the JR blog if you would like to use them in your classrooms in the future. 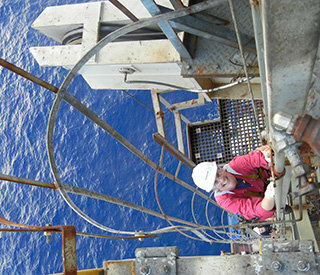 Monday: I climbed up to the top of the derrick last Friday! If the derrick stands 44.8 meters above the deck and the rungs of the ladder are 12 inches apart, how many rungs did I have to climb up to get to the top? Since 12 inches = 1 foot, I had to climb up about 146 rungs to get to the top! Tuesday: Our kite contest is coming up this week, and since I’ve never made a kite before, I looked to the Internet to find a tutorial. Unfortunately, the sticks I had available were shorter than the ones in the tutorial, so I had to scale the measurements down. If the sticks I had were 91.5 cm long and the ones in the tutorial were 120 cm long, what was the scale factor that I had to multiply all the measurements by to make my kite with the materials available? I had to multiply all of the measurements in the tutorial by 0.7625 to make my kite. Wednesday: We left site U1382 at noon today, headed for a new site to core: U1384, which is 3.38 nautical miles away. We are traveling in DP (dynamic positioning) mode at about 0.85 knots (nm/hr). When we get there, we will send the core barrel down, pressure up the drill string to extend the barrel into the sediment, then raise the core up onto the ship. The water depth is about 4450 meters, and the core barrel travels at about 200 m/min. What time should we expect the first core on deck from the new site? We should expect the first core on deck at about 1645 (4:45 PM). Thursday: We are leaving soon for the Azores, can you believe it? Ponta Delgada is about 1380 nautical miles from here, and we will travel at about 10.5 knots (nm/hr). If we need to be at the pilot station by 0700 (7 AM) on Thursday morning, November 17, when do we need to leave our study site? We need to leave by approximately 1930 (7:30 PM) Friday, November 11 in order to make it to the Azores in time. Friday: It’s 11-11-11! If we were to travel at 11 knots for the next 11 hours and 11 minutes, how many kilometers closer to the Azores would we be? We will be 228 kilometers closer to the Azores after 11 hours and 11 minutes at 11 knots.